[Auto translated] It might be a platitude but this is a really often asked question whether Guinea Pigs needs water or not. The short answer is: Yes, of course they need water! 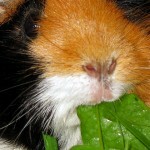 Cavies are mammals and all mammals needs fresh water every day for their water balance. In many countries you can buy special water called “rodent-water” or something similar in pet shops. But if you take care in feeding your cavies diversified there is no need to buy any of these products. They do not need special water – filled with dietary supplements or anything like that. 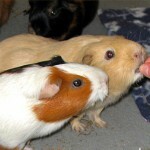 Healthily cavies do not need supplemented vitamins in expensive synthetic products. If your tap water is in good condition it will fit your cavies needs like yours and you can provide it. 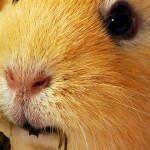 A cavy needs about 100ml fresh water every day. But there are cavies who do not drink so much. This is no problem if they get the water from fresh food. Cucumbers and other vegetables contains a lot of water. But you have to provide water also separate. Other Guinea Pigs drink very much water. If one of your cavies really swig go for a veterinarian. May be it has diabetes. Water has to be accessible easy. There are many different kinds to provide water. Your choice how to provide it should be based on the priority of your cavies. Test which system they used most frequent. The drink bottle is widely used. It is clipped from the outside of the cage with a small pipe into it. The pipe is shortened at the end and a small ball inside prevents leakage. The cavy needs to hit against this ball continuous to drink and every clap supplies only a drop of water. This generates the classic clicking sound when rodents are drinking They have to hit the ball often. Sippy bottles has a great benefit compared to the classic drink bottle: The opening is closed with a small gib the cavies only need to lift a bit to keep the water flowing continuous. The tongue does not have to work so much and drinking becomes easier. For that reason our cavies prefer Sippi. And of course we also do so. The bowl might be the best because they do not need to forge their heads. This makes drinking easy. But for some reason most Guinea Pigs does not really like bowls. Bowls have the great disadvantage that the water will be polluted with litter, litter-dust, hay and something like that quickly if you have got active cavies in your cage. They won’t dink water like that. Test it. 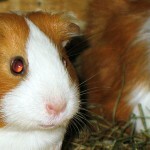 If you are keeping Guinea Pigs outdoors you have to secure that the water does not freeze. There are several systems available. Do never mix antifreeze into the water!